Luxembourg combines a diverse fund offering with a depth of expertise developed over many years as Europe's leading investment fund centre. As the second-largest fund servicing jurisdiction in the world after the United States, Luxembourg is a favoured destination for fund managers and investors alike, thanks to its stable political and social environment, versatile fund products, leadership in investor protection, and experienced and responsive regulator and service providers. The steady growth of assets under management in Luxembourg funds has been mostly driven by the country's success in positioning itself as the leading centre for undertakings for collective investment in transferable securities (UCITS). In recent years, a second fund label has noticeably developed: alternative investment funds (AIFs), which include private equity, real estate, infrastructure, debt and hedge funds, all dedicated to an institutional, professional or sophisticated investor base. Over the past few years, government efforts have been mainly directed at increasing transparency, protecting market stability and preventing the build-up of systemic risk in the financial system. Those large-scale reforms have been, to a large extent, driven by European initiatives. A cornerstone of Luxembourg's success as an investment fund centre is its comprehensive legal and regulatory system, which benefits managers and investors alike. The Commission de Surveillance du Secteur Financier (CSSF), a public institution with legal personality and financial autonomy, is entrusted with the supervision of the financial sector in Luxembourg.7 It operates under the authority of the Ministry of Finance. the oversight of the marketing conditions of Luxembourg and foreign investment funds (in particular, those marketed to non-professional investors). In addition to those supervisory duties, the CSSF issues regulations and circulars in accordance with existing laws. Luxembourg collective investment undertakings fall under two broad categories: regulated and unregulated vehicles. Another distinction is made as to whether these collective investment undertakings are subject to a specific law (product law) or not. the law of 23 July 2016 on reserved alternative investment funds (RAIF Law). Regulated funds are subject to CSSF supervision and must (or their IFM must on their behalf) apply for and receive an authorisation from the CSSF before they start operating. certain securitisation undertakings subject to the law of 22 March 2004 (Securitisation Law) when they issue their securities to the public on a continuous basis. All these vehicles, once approved, are registered on official lists maintained by the CSSF and accessible on its website. where appropriate, the IFM and other operators of these vehicles. The regulator may request additional information as part of the approval process. The legal representatives of the funds or their management company as well as their service providers must demonstrate that they are of sufficiently good repute and sufficiently experienced. Any replacement of a legal representative or a service provider, and any change to the constitutional or offering documents or to the contractual arrangements, are subject to the prior approval of the CSSF. The appointment of a liquidator also requires prior approval, and the CSSF remains competent for the supervision of the vehicle until the close of the liquidation. UCITS are subject to strict, EU-driven organisation and management requirements, and rules on diversification, liquidity and use of leverage. UCITS benefit from a European distribution passport, and as such are eligible for sale to retail investors in the EAA and various non-EAA countries. Because of their more flexible investment policy and distribution rules, funds subject to Part II of the UCI Law do not qualify as UCITS. They are less constrained as to the type of assets they can invest in, the investment strategy they use, the diversification rules they are subject to and the liquidity they offer to investors. The SICAR is an investment vehicle designed specifically for investment in risk capital, as detailed in CSSF Circular 06/241. SICARs allow direct or indirect contributions of assets to be made to entities in view of their launch, development or listing on a stock exchange. Unlike other investment funds, the SICAR is not subject to investment diversification rules, or lending or leverage restrictions. Investment funds that are not directly subject to CSSF supervision include RAIFs and standard commercial companies. investment and leverage rules regarding certain types of assets. However, in exchange for complying with the AIFM Law requirements, RAIFs benefit from the AIFMD passport in order to be marketed to professional investors (and retail investors if permitted by the relevant Member States) in the EAA. Under certain conditions, securitisation vehicles (whether regulated or not) can be used as an alternative to the more traditional forms of investment vehicles. SOPARFIs are ordinary commercial companies whose corporate object is limited to the holding of participations in other companies. While they may in principle take any corporate form available under the law of 10 August 1915 on commercial companies (Companies Law), in practice they will take the form of share capital companies. As an unregulated company, the SOPARFI is not subject to any risk-spreading requirements, and may in principle invest in any asset class. SOPARFIs may also manage their financial participations and conduct commercial activities that are directly or indirectly connected to the management of their holdings, including the debt servicing of their acquisitions. Commencing business as an authorised IFM in Luxembourg is subject to prior approval by the CSSF. Authorised IFMs are UCITS management companies subject to Chapter 15 of the UCI Law; and authorised AIFMs subject to the law of 12 July 2013 on alternative investment fund managers (AIFM Law). The application for authorisation must be accompanied by a programme of activity setting out the capital, human and technical resources, corporate governance and organisational structures of the IFM. Management companies authorised under the UCITS Directive may also apply for authorisation as an AIFM (and vice versa), as defined by Directive 2011/61/EU, to manage both UCITS and AIFs. The UCI Law and the AIFM Law allow authorised IFMs to benefit from an extended scope of activity, in particular for the provision of discretionary management services. As non-core services, those management companies can offer investment advice on financial instruments and the administration of UCIs under certain conditions. An authorisation granted to a management company under the UCITS or the AIFM Directives is valid for all EU Member States. The business of an AIFM covers the portfolio management and risk management of one or more AIFs. AIFM authorisation is required when the AIF assets the AIFM manages are above the thresholds set out in the AIFM Law. The AIFM may be an external entity, or the AIF itself in the case of an internally managed AIF.9 Only corporate AIFs such as investment companies can be internally managed. Internally managed AIFs are subject to almost all of the same requirements as AIFMs. Registered AIFMs do not benefit from the AIFMD passport, and may not freely market the AIFs they manage on a cross-border basis. For the time being, they may continue to market the AIFs they manage within the EAA under the national private placement regimes on a country-by-country basis. When the AIF assets under management of a management company are below the AIFM Law thresholds, a management company subject to Chapter 16 of the UCI Law can manage that AIF without being authorised as AIFM. Otherwise, it must either seek authorisation as an AIFM or designate another entity as AIFM. 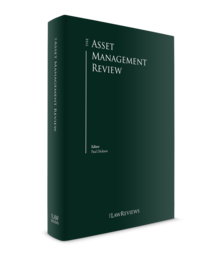 Chapter 16 management companies may also manage investment vehicles other than AIFs. Over the past few years, the regulatory regime applicable to depositaries in Luxembourg has been subject to significant changes brought about by the AIFM and the UCITS V Directives. The UCITS V Directive generally aligned the role and responsibilities of UCITS depositaries with the AIFMD regime. Those two depositary regimes, however, differ in that the AIFMD allows the contractual transfer of liability from a depositary to a sub-depositary (including a broker acting as sub-depositary) and extended possibilities for rehypothecation of assets. overseeing the fund's operations to ensure that they comply with Luxembourg laws and the constitutional documents of the fund. Investment funds subject to a product law and AIFs managed by an authorised AIFM must appoint a single depositary to supervise and monitor their assets. The appointment and replacement of the depositary must be approved by the CSSF. UCITS and Part II UCIs that may be marketed to retail investors in Luxembourg are subject to the UCITS V Directive depositary regime.11 Their depositary must be a credit institution with its registered office in Luxembourg or a Luxembourg branch of a credit institution with its registered office in another EU Member State. Part II UCIs whose offering documents prohibit marketing to retail investors in Luxembourg are subject to the AIFMD depositary regime.12 SIFs, SICARs, RAIFs and other AIFs managed by authorised AIFMs, and internally managed AIFs that are subject to the AIFM Law, are also subject to the AIFMD regime. They must appoint a Luxembourg credit institution or Luxembourg branch of an EU credit institution, a Luxembourg investment firm, a Luxembourg branch of an EEA investment firm, or – under certain conditions detailed below – a Luxembourg professional depositary of assets other than financial instruments. Introduced by the AIFM Law, professional depositaries may only be used by AIFs that have no redemption rights for a period of five years from the date of the initial investments and either do not invest in financial instruments that must be held in custody in accordance with the AIFM Law (typically real estate funds), or invest in issuers or non-listed companies in order to potentially acquire control over such companies under the AIFM Law (typically private equity and venture capital funds). Foreign UCITS must be notified to the CSSF by the competent authority of the fund's home state before they can market their securities in Luxembourg. They must also appoint a Luxembourg paying agent and one or more financial correspondents whose duties are, among others, dealing with subscriptions and redemptions, informing investors, and paying the CSSF fees. AIFMs authorised in another EAA Member State may market securities of EAA AIFs to professional investors in Luxembourg13 and, subject to certain conditions, to retail investors. Marketing to retail investors in Luxembourg requires that an EU AIF established in a Member State other than Luxembourg is subject in its home Member State to a level of investor protection and prudential supervision considered by the CSSF as equivalent to that provided for in Luxembourg. Regardless of whether an existing passport to do management business under another directive (such as UCITS) is held, EEA AIFMs are required to make a separate notification to their home state competent authority if they intend to manage or market an EEA AIF on the basis of the EU passport. The home state competent authority will send the management passport notification to the CSSF along with a certificate (as mentioned in Article 33(4) of the AIFMD) on behalf of the EEA AIFM. The EEA AIFM can commence its management activities in Luxembourg from the date of notification by the home state competent authority to the CSSF. The home state competent authority will send the passport notification and the certificate to the CSSF if the EEA AIFM intends to distribute to investors, Luxembourg AIFs or EEA AIFs within Luxembourg.14 The EEA AIFM can commence its distribution activities in Luxembourg from the date of notification by the home state competent authority to the CSSF. Currently, AIFMs based in non-EEA countries intending to market AIFs in Luxembourg are required to conduct distributions on a private placement basis and to observe the financial promotion rules. UCITS, Part II UCIs, SIFs and RAIFs can generally be formed as contractual vehicles (FCPs) or as corporate vehicles (investment companies) depending on, among other considerations, corporate governance or tax requirements. By contrast, SICARs can only be set up as investment companies. Similar to a unit trust in the UK or a mutual fund in the US, an FCP is organised as a co-proprietorship whose joint owners are only liable up to the amount they have committed or contributed to the fund. An FCP has no legal personality, and must be managed by a Luxembourg management company regardless of whether it is created under the UCI Law, the SIF Law or the RAIF Law. The management company acts on behalf of the FCP, which includes the appointment and oversight of its service providers. Corporate vehicles may be set up either as investment companies with variable share capital (SICAV) or as investment companies with fixed share capital (SICAF). In a SICAV, the capital increases or decreases in proportion to inflows or outflows of funds, or changes in the net asset value of the fund, whereas a SICAF requires a decision (usually formalised in a notarial deed) to vary the capital in accordance with company law requirements. The legal forms typically used by investment companies are the public limited company, the private limited company, the partnership limited by shares, the common limited partnership or the special limited partnership. While SIFs and SICARs can select all these legal forms, SICAVs subject to Part I or Part II of the UCI Law must be set up as public limited companies. UCIs organised as SICAFs may also be incorporated as partnerships limited by shares. The common limited partnership and the special limited partnership deserve special attention. Both partnerships must be formed between one or more general partners who are liable for all the debts and obligations of the partnership, and one or more limited partners whose liability is limited to the amount of capital that they contribute or commit to the partnership. Introduced in 2013 along with the implementation of the AIFM Directive, the special limited partnership – unlike the common limited partnership – does not have separate legal personality. However, all contributions, acquisitions and dispositions of assets can made in the name of the special limited partnership rather than in a general partner's or limited partners' name. The common limited partnership and the special limited partnership benefit from generally being transparent for tax purposes (see Section VII). A SOPARFI is usually organised in the form of a public or private limited company, or a partnership limited by shares, and will operate with fixed or authorised capital features. The latest company law reform of August 2016 introduced, among other noteworthy changes, the simplified limited company. All funds subject to a product law may be formed as umbrella structures composed of one or more sub-funds. Each sub-fund comprises a specific portfolio of assets and liabilities separate from the portfolio of assets of the other sub-funds, except if otherwise provided for in the constitutional documents of the fund. The assets of a specific sub-fund may only be used to satisfy its own debts and obligations. Furthermore, various classes of shares, units or partnership interest may be created within regulated or unregulated investment vehicles alike (or within their compartments). The typical features of these classes include different liquidity and distribution entitlements, minimum subscription or holding requirements, fee structures, reference currencies and target investors. All classes tap into the same pool of assets within the vehicle or the specific sub-fund, but the net asset value per share, unit or interest of each class may vary as a result of the specific features of that class. Unlike for sub-funds, there is no ring-fencing of assets and liabilities among classes of the same compartment. As a result of investor demand and the current political uncertainty over Brexit, and especially as to the implementation of a third-country marketing or management passport, as well as the limitation of reverse solicitation capacities, a number of re-domiciliation, next product or parallel structures in Luxembourg involving both regulated and non-regulated funds have been realised or are being examined. Recent months have seen more and more asset managers, financial institutions and insurance companies move forward with their plans to relocate or re-domicile all or parts of their business to Luxembourg. During the past few months, Luxembourg has seen strong interest in AIFs that are not subject to a product law and in RAIFs. The main asset classes in these vehicles are typically private equity, venture capital, infrastructure, clean technology, real estate and debt. Interest in SIFs and UCITS remains continuous, in particular those that have particular strategies or are investing in more 'exotic' markets. There also has been strong demand for unregulated AIFs structured as partnerships (special limited partnerships or common limited partnerships), in particular for illiquid or novelty asset classes. On 1 January 2018, the Packaged Retail and Insurance-based Investment Products Regulation (PRIIPs Regulation) entered into force in the EU. As regards the implementation of the PRIIPs Regulation in Luxembourg law, an implementing law was published on 19 April 2018 (PRIIPs Law). The PRIIPs Law designates the CSSF and the Insurance Commission (CAA) as the competent authorities responsible for the supervision of compliance with the PRIIPs Regulation in Luxembourg, and gives them specific supervisory and investigation powers. In addition, it details administrative sanctions and measures that can be imposed in cases of violation of the PRIIPs Regulation. On 15 May 2018, the Luxembourg Parliament implemented the revised EU Markets in Financial Instruments regime (MiFID II) into Luxembourg law. The CSSF also published an MiFID-dedicated frequently asked question section on its website,24 which is updated on a regular basis. Although investment funds and their IFMs are outwith the scope of MiFID II, they are indirectly affected by MiFID II when they rely on MiFID entities for the provision of MiFID services, such as distribution, portfolio management or brokerage services, or where MiFID entities provide investment services in relation to investment funds to the clients of those funds (e.g., reception or transmission of orders). UCITS management companies and AIFMs must also comply with specific MiFID II requirements if they have an extended licence for the provision of certain MiFID services. On 16 May 2017, the European Council adopted the Money Market Fund Regulation (MMF Regulation) aimed at supporting the role of money market funds (MMF) in financing the economy. The Regulation introduces three forms of MMF: the public debt constant net asset value, the low volatility net asset value and the variable net asset value. To improve MMFs' stress resistance, the MMF Regulation sets out requirements on asset portfolio diversification, investment policies, and liquidity and concentration. The new rule also foresees the initiation of a stress test process. The new regime will be monitored at the European level, and may be subject to review after five years. In March 2018, the CSSF published two warnings on the significant risks linked to investments in initial coin offerings (ICOs), and tokens and virtual currencies (also called VCs, cryptocurrencies or virtual money).25 Considering that these investments are not suitable for all types of investors and investment objectives, the CSSF prohibits direct and indirect investments in VCs through ICOs by UCITS, other retail UCIs and pension funds. As a result, only investment funds restricted to professional investors are allowed to invest directly or indirectly in these investments, provided that they take into account the substantial risks identified by the CSSF. Debt and credit funds are increasingly present in Luxembourg thanks to the flexible legal and regulatory environment that allows them to implement all types of debt and credit strategies, such as mezzanine, distressed and origination strategies. the Grand Ducal Regulation of 5 December 2007 establishing the terms and conditions of the supplementary supervision of insurance and reinsurance undertakings that are part of an insurance or reinsurance group. These legal provisions determine the authorisation procedure and business conduct of insurance and reinsurance companies, the mission and procedural methods of the CAA, and the free provision of services by Luxembourg insurance companies in other Member States of the European Union. Insurance contracts are governed by the amended law of 27 July 1997 on insurance contracts. Traditionally, life insurance companies offer guaranteed return products where premiums are managed in the insurer's general fund (or in that of its parent company). In addition, Luxembourg insurance companies propose a wide range of unit-linked products27 established as external investment funds managed by third-party asset managers; internal collective funds that operate like UCITS and that allow discretionary management tailored to the various risk profiles of investors; or internal dedicated funds that allow discretionary management that takes the subscriber's personal objectives into account. Several dedicated funds can be grouped within the same life assurance contract. Pension savings companies with variable capital (SEPCAVs) and pension savings associations (ASSEPs) are two legal entities created by the law of 8 June 1999. They are governed by the law of 13 July 2005 on institutions for occupational retirement provision in the form of pension savings companies with variable capital (SEPCAVs) and pension savings associations (ASSEPs), which implements Directive 2003/41/EC on the activities and supervision of the institutions for occupational retirement provision. SEPCAVs have a corporate structure similar to that of SICAVs, in which the members and beneficiaries are shareholders who will receive a share of a fund's profits when retiring. SEPCAVs can only be used for defined contribution schemes. ASSEPs, on the other hand, work like associations that can be used for both defined contribution and defined benefit schemes. In an ASSEP, the rights of the members and beneficiaries are debt claims that, when the members and beneficiaries retire, will be paid out either as a lump sum or as an annuity. ASSEPs may also cover additional benefits on the death or disability of their members. SEPCAVs and ASSEPs must be authorised by the CSSF to conduct their business. Pension funds supervised by the CAA are subject to the CAA Regulation of 31 August 2000. CAA pension funds offers flexibility in the form of the vehicle for defined contributions, defined benefits or additional benefits on the death or disability of members. Four legal forms can be chosen, but in practice the not-for-profit association form is the most commonly used vehicle. CAA pension funds can either finance defined benefits or defined contributions schemes. Real estate funds can be set up as unregulated or regulated vehicles. When they are subject to CSSF supervision, they fall under the Part II of the UCI Law and CSSF Circular 91/75, unless they have been established under the SIF Law or, where their assets represent risk capital investments, under the SICAR Law. CSSF Circular 91/75 requires that real estate Part II UCIs invest no more than 20 per cent of their net assets in a single property, subject to a ramp-up period of up to four years. In principle, real estate Part II UCIs may not borrow more than 50 per cent of the value of all the properties. Their net asset value must be calculated at least once a year, and an independent valuer must be appointed to assess the value of the properties. Real estate SIFs are subject to CSSF Circular 07/309, which restricts investment in a single property to 30 per cent of their assets, but they may in practice take advantage of a similar start-up period as real estate UCIs. Although borrowing restrictions are more flexible for this vehicle, the AIFM Law requires that an AIFM determines the maximum leverage levels for the fund. b are acquiring the property to sell at a capital gain in a relatively short time frame. Real estate funds can also be formed under the RAIF Law under the same conditions as those detailed for SIFs and SICARs above. Finally, SOPARFIs can also be used to set up unregulated real estate funds. Although a limited number of UCITS employing hedge fund strategies may be marketed to retail investors on the same basis as other UCITS funds, hedge fund strategies are usually pursued under Part II of the UCI Law, the SIF Law or the RAIF Law. CSSF Circular 02/80 sets forth specific rules applicable to Luxembourg UCIs pursuing alternative investment strategies. The Circular determines the investment restrictions generally applicable to these types of Luxembourg UCIs. SIFs and RAIFs are not subject to any investment eligibility requirements, and are therefore best suited to accommodate all sorts of alternative strategies. They are both, however, required to diversify their investments to 30 per cent of their assets (unless for certain fund of funds or feeder funds) as further set out in CSSF Circular 07/309. CSSF Circular 08/372 specifies the rules on the appointment of prime brokers, the relationship between the depositary and the appointed prime brokers, and the liability of the depositary in that respect. Private equity funds in Luxembourg take advantage of a large choice of structuring options, such as Part II UCIs, SICARs, SIFs, RAIFs, and other types of unregulated companies or partnerships. In practice, the special limited partnership, the common limited partnership or the SOPARFI are typically used. Amid an international regulatory environment seeking to increase transparency and oversight, the SICAR and the SIF are tried-and-tested regulated private equity and venture capital structures. They combine a flexible and accessible regulatory infrastructure with strong investor protection features. The RAIF should follow the same pattern. In addition, Luxembourg regulated and unregulated vehicles can be set up as EuVECA funds. These are restricted to equity instruments issued by or loans granted to qualifying portfolio undertakings, meaning undertakings that are at the time of the first investment by the fund in that undertaking not admitted to trading on a regulated market or multilateral trading facility, and that employ up to 499 persons. Small and medium-sized enterprises (SMEs) that are listed on SME growth markets will also be allowed under the revised EuVECA Regulation. EuVECA funds are also subject to specific rules in respect of fund portfolio composition, investment techniques and own funds. In particular, these funds must intend to invest at least 70 per cent of their aggregate capital contributions and uncalled committed capital in assets that are qualifying investments and, as a consequence, not use more than 30 per cent for the acquisition of assets other than qualifying investments. One of the defining features of the EuVECA regime is that it does not require the appointment of a depositary. The EuVECA Regulation applies to EU managers that are subject to registration with the competent authorities of their home Member State in accordance with the AIFMD and manage qualifying venture capital funds with total assets under management of less than €500 million. The use of the revised EuVECA label is now also open to above-threshold AIFMs that continue to be subject to the requirements of the AIFMD while complying with certain provisions of the EuVECA Regulation (those on eligible investments, targeted investors and information requirements). EuVECA managers can also manage and market AIFs that are not EuVECA funds. However, the EuVECA passport does not apply to these funds. Luxembourg is also home to a number of investment funds that are compliant with shariah principles, and of cleantech and other new technologies funds. UCITS, Part II UCIs and SIFs, whether they are established in a contractual form (FCP) or a corporate form (SICAV or SICAF), are exempt from all taxes apart from a fixed registration duty levied on the contribution of capital and a subscription tax. The subscription tax is calculated in proportion to the net assets of funds at the end of each quarter. The standard annual rate for UCITS and Part II UCIs is 0.05 per cent. Funds investing in money market instruments and bank deposits, SIFs, and sub-funds and classes of UCIs that are reserved to institutional investors, are subject to a reduced rate of 0.01 per cent. In addition, a subscription tax exemption is available for funds investing in other Luxembourg UCIs that are subject to subscription tax, institutional money market UCIs, exchange traded funds, pension pooling funds and microfinance funds. UCITS, Part II UCIs and SIFs are not subject to withholding tax on distributions. As tax-exempt entities, Luxembourg funds are not entitled to local or foreign tax refunds (unless a tax treaty applies) or credits. SICAVs and SICAFs may benefit from a limited number of double taxation treaties, reducing withholding tax rates in the countries in which they invest. By contrast, FCPs cannot in principle avail themselves of double taxation treaties: however, their unitholders could claim the reduced rate under a double taxation treaty between the country of source of the income or gain and the country of residence of that investor. The tax treatment of SICARs will depend on whether they are formed as tax-transparent vehicles or as a non-tax transparent vehicles. SICARs incorporated as non-transparent vehicles are fully taxable companies and, as such, are subject to corporate income tax (CIT) and municipal business tax (MBT). However, income and capital gains from transferable securities are exempt from income taxes, and distributions of dividends are also exempt from withholding taxes, irrespective of the residence and tax status of their shareholders. Income on cash held by SICARs for future investment is also tax-exempt for a period of 12 months. Other income is subject to CIT and MBT at an aggregate rate of 26.01 per cent (for Luxembourg City in 2018). SICARs are also subject to an annual net wealth tax (NWT) of €4,815 if their financial assets, transferable securities, bank deposits and receivables against related parties exceed 90 per cent of the total of their balance sheet and €350,000. If any one or more of these requirements are not met, the NWT ranges from €535 to €32,100, depending on a SICAR's balance sheet total. SICARs can take advantage of most double taxation treaties concluded by Luxembourg, as well as the EU Directives. SICARs formed as a tax-transparent vehicle for Luxembourg tax purposes are subject to the provisions detailed under subsection ii. RAIFs can generally elect to be treated as SICARs or SIFs for Luxembourg tax purposes. If their exclusive purpose is to invest in risk capital, RAIFs are subject to the same tax regime as SICARs. If they pursue another strategy, they are subject to the same provisions as SIFs. Funds that are not subject to a product law are usually set up in the form of partnerships (common or specialised limited partnerships). As transparent entities for Luxembourg tax purposes, partnerships are not subject to CIT or NWT. Further, a partnership that is an AIF is not subject to MBT, provided that (as is usually the case) its general partner holds less than 5 per cent of the interests in the partnership. Partnerships are not eligible for the benefits of double taxation treaties. However, an investor in a Luxembourg partnership should in theory be able to claim the reduced rate under a double taxation treaty between the country of the source of the income or gain and the country of residence of the investor: this would typically be possible if the partnership is recognised as tax-transparent by both the investee's and the investor's countries. SOPARFIs are companies subject to CIT and MBT on their income at an aggregate rate of 26.01 per cent (in Luxembourg City in 2018). However, income received by a SOPARFI from its shareholdings (dividends, liquidation proceeds) and capital gains realised upon the sale of these shareholdings are exempt to the extent that the conditions of the Luxembourg participation exemption regime are met. Further, dividend distributions to corporate shareholders are exempt from withholding tax under certain conditions. The distribution of liquidation proceeds is also exempt from withholding tax without any condition. SOPARFIs benefit from the double taxation treaties concluded by Luxembourg, as well as from the EU Directives. SOPARFIs are also subject to NWT in Luxembourg: a rate of 0.5 per cent applies on the portion of net wealth that is lower than or equal to €500 million, while the exceeding portion is subject to a reduced rate of 0.05 per cent. However, subject to the application of the participation exemption regime, qualifying shareholdings are exempt from NWT. A SOPARFI is subject to an annual minimum amount of NWT of €4,815 if the financial assets, transferable securities, bank deposits and receivables against related parties of the SOPARFI represent more than 90 per cent of its balance sheet and exceed €350,000. If the SOPARFI does not meet these requirements, the minimum NWT varies between €535 and €32,100, depending on the level of its total balance sheet. Luxembourg IFMs generally take the form of companies with share capital, which are fully subject to CIT, MBT and NWT under the same conditions as those applicable to SOPARFIs. The management of funds that are structured under a product law is exempt from VAT in Luxembourg. The VAT exemption applies to, among other services, investment management (including risk management) and administration (e.g., investment advice, transfer agent and registrar functions). Management services outsourced to third-party managers also benefit from the VAT exemption under certain conditions (they should notably be specific to, and essential for the management of, the fund). In addition to management services, services related to the distribution of investment funds are also exempt from VAT. Other services rendered to investment funds, such as legal and audit services, cannot benefit from a VAT exemption and are subject to the standard VAT rate of 17 per cent. Depositary services are partly exempt from VAT; services related to the control and supervision functions of the depositary are subject to a reduced VAT rate of 14 per cent. Funds with corporate form are VAT persons, and may be subject to Luxembourg VAT registration if they receive goods or services from abroad for which they must account for Luxembourg VAT on a reverse-charge basis. FCPs must account for Luxembourg VAT on a reverse-charge basis through the VAT number of their management company. The regulatory agenda will remain challenging for the asset management industry in the years to come, but will also offer many opportunities for development. New EU regulatory developments will continue to dominate the outlook of the Luxembourg fund industry. Luxembourg has adopted a proposal put forward by the Organisation for Economic Co-operation and Development as part of the base erosion and profit shifting project. On 20 June 2018, a bill implementing the EU Anti-Tax Avoidance Directive dated 12 July 2016 (ATAD I) was published. While all Member States must implement ATAD I, some of its provisions are optional and, as a result, not all Member States will have identical ATAD I provisions in their domestic laws. It also contains two additional provisions that are unrelated to ATAD I. The first provision would repeal the provision that allows (among others) a bondholder to convert a loan into shares in a tax-neutral manner, while the second would amend the permanent establishment provision under Luxembourg domestic law. The European Commission is seeking to iron out contradictory interpretations of the marketing function as part of its capital markets union initiative, which is aimed at bringing greater harmonisation and uniformity across EU Member States to facilitate easier cross-border investment. Under proposals announced in March 2018, pre-marketing will be unavailable to existing AIFs; nor will firms be able to share with investors details about the constitutional documents of soon-to-be-established AIFs. Some industry bodies have come out against the provisions, warning that the rules introduce added complexity and restrictions for asset managers looking to sell into the EAA. Assuming that the UK will become a third country after its withdrawal from the EU, Luxembourg will continue to monitor closely the European Securities and Markets Authority's proposals for delegation arrangements and outsourcing to third countries while continuing to welcome IFMs and investment funds willing to relocate to Luxembourg. The flexibility enjoyed by SIFs, SICARs and other UCIs may be reduced in the future. In January 2016, bill of law 6936 was deposited with the Luxembourg Parliament, amending a number of product laws and the AIFM Law. Under the bill, UCI investors that are not professional investors under MiFID II will only be able to invest in certain types of assets (as determined by the CSSF). It is expected that the CSSF will restrict investment in certain tangible assets or investments related to individuals (or their rights). In addition, closed-ended UCIs will no longer be required to issue shares based on their total net asset value. Instead, this will be based on a price fixed in accordance with their constitutional documents. Luxembourg welcomes the European Commission's plan to create a standardised pan-European personal pension product (PEPP). The PEPP aims to link investment products to individuals rather than to an employment relationship, and provides opportunities not only for workers and job seekers, but also for the Luxembourg asset management industry. Fintech, and technology in general, will remain an important area of focus for Luxembourg. Various associations aim to raise awareness, identify the challenges and develop opportunities inherent in new digital technologies for the fund industry, such as regtech and blockchain tools, which are expected to reduce costs and increase efficiency in the industry over time. 1 Pierre De Backer is a principal at Deynecourt. The author wishes to thank Ekaterina Vaahtera for her assistance in the preparation of this chapter. 2 CSSF newsletter June 2018. 3 CSSF press release 18/19. 4 CSSF press release 18/21. 5 CSSF newsletter June 2018. 6 Commission de Surveillance du Secteur Financier, 2016 Annual Report, July 2017. 7 Law of 23 December 1998 establishing a financial sector supervisory commission. 9 A RAIF cannot be internally managed and must be managed by an authorised AIFM. 11 UCI Law, Article 17 et seq. 12 AIFM Law, Article 19. 13 AIFM Law, Articles 31 and 33. 14 AIFM Law, Article 31. 17 FAQ Alternative Investment Fund Managers. 18 CSSF newsletter February 2018. 19 CSSF annual report 2016. 20 PwC Global Fund Distribution 2017. 21 ALFI, Global Fund Distribution 2017. 22 CSSF annual report 2016. 23 Official list at the companies register as at 16 July 2018. 24 MiFID II/MiFIR – Questions and Answers. 25 Warning on initial coin offerings and tokens; March 2018. Warning on virtual currencies, March 2018. 26 ALFI, 2017 annual report. 28 Grand Ducal Regulation of 14 July 2010.